Sharp’s LC-37D7U LCD Television is the largest offering in its new AQUOS D7U series. Having spent considerable time with its smaller sibling, the LC-26D7U, I was not surprised to see that picture quality, sound quality, and industrial design were all top-notch. Sharp is the industry innovator in the field of LCD TV production and sells more LCD panels than any other manufacturer. The AQUOS D7U LCD flat panel series is a feature-packed line of LCD HDTV displays that come with attached desktop stands, built-in HD tuners, and excellent sound, all matched with phenomenal picture quality. This model replaces the LC-37GD6U. With its stand attached the Sharp AQUOS LC-37D7U LCD is 28.5 inches tall and looks handsome clad in titanium-color materials. The screen area is cleanly trimmed in black and easy access controls are located on the top of the display. The LCD TV is 36.5 inches wide and 1 foot deep with its base attached. With the base removed the depth shrinks to about 4.5 inches. The speakers, which are neatly housed below the screen, can also be removed. The included speakers are powerful, pumping out 20-watts of quality sound. Numerous options for receiving analog, digital, HD, and cable feeds are included, including a built-in CableCARD slot and ATSC tuner. Like its little brother in the AQUOS family, the LC-26D7U, the Sharp LC-37D7U delivered excellent picture quality. Accurate picture quality has long been a staple of the AQUOS line. Watching 1080i HDTV fed from our tuner via composite connectors was an exceptional experience, as was watching video content from DVDs. Spread over the larger 37-inch LCD screen area, the 1366x768 resolution lacked the up-close precision that the LC-26D7U maintained even at only a couple feet. The smaller LCD-27D7U packs just over 3700 pixels into every square inch of display, whereas the LCD-37D7U has slightly less than 1800 pixels per square inch. This simply connotes that you will not want to put this display in a room only 6 feet deep. Viewing this LCD Television anywhere from 8 to upwards of 14 feet was an absolute joy. I set the Sharp AQUOS LC-37D7U LCD up next to Panasonic’s 42-inch plasma, the TH-42PWD7, and Sony’s 23-inch LCD, the KLV-S23A10. These are two products that aren’t equal comparisons but shoppers buying a large LCD television like the LC-37D7U might be considering it as an alternative to Plasma, or as an upgrade from a smaller LCD TV. The AQUOS held its own against both displays. With the Sharp sitting next to the Panasonic plasma I was partial to the color accuracy on Sharp’s AQUOS. Sharp’s displays are not known for having exaggerated, over enhanced colors and the LC-37D7U was no exception. Thanks to the display’s 800:1 contrast ratio darks were maintained very well, though black levels on LCD TVs will likely never match plasma black levels. 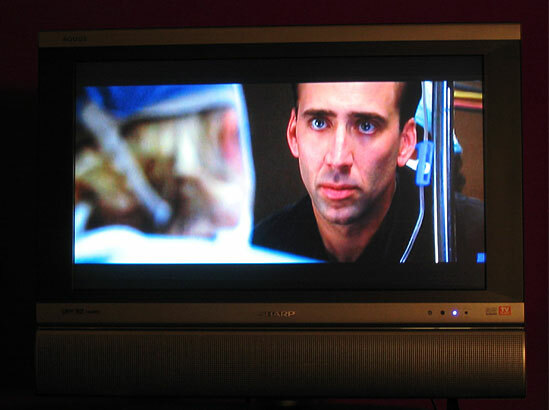 In City of Angels, where Nicholas Cage bounces between sunlit rooftops and dark hospital hallways, every scene maintained detail. When reproducing bright or colorful scenes I was partial to the AQUOS over the Sony. Only when sitting closer than 8 feet did the small Sony display’s greater pixel-density begin to improve the viewing experience. Sitting back from the TV, I enjoyed watching sunlight radiate through giant sheets of seaweed in an undersea HDTV documentary. The LC-37D7U LCD TV reproduced bright, colorful, 1080i scenes with incredible clarity. Fast-action scenes in the Borne Supremacy exhibited little motion lag artifacts typically related to LCD response times. Also, with 480i input the TV’s de-interlacer performed excellently. Watching fast-action on the Sharp AQUOS LC-37D7U was a pleasure and less taxing on the eyes than the adjacent Sony LCD TV. One adjustment that owners definitely will want to make is to turn down the backlight adjustment from its factory default maximum (+8) to prolong the bulb's life (unless you are in an extremely bright sunlit room). I recommend turning the backlight setting down to 0 for normal viewing conditions. Sharp rates the bulb's life at 60,000 hours. A thoughtful feature of this display is an OPC feature that, when enabled, automatically adjusts the backlight according to ambient light in the viewing room. This feature is ideal for use in a bedroom or living room where a user might want take advantage of the built-in sleep timer to doze off to a movie, with the backlight turned down, and wake up to the morning news with the LC-37D7U LCD TV's florescent bulb working full-throttle, shining through a sun-filled room. I experimented with the OPC setting by turning on and off recessed lighting in the viewing room and watching the display automatically adjust between intermediate backlight settings. For a more robust, if-not ridiculous, test of the OPC feature, I darkened the room and then turned a halogen light, aimed straight at the LCD television, on and off and watched the unit bounce between its lowest and highest backlight settings. While the auto-backlight adjust feature worked impressively during this test, what struck me as astounding was that even with a halogen light pointed directly at the LCD, there was minimal glare thanks to the display's excellent anti-glare technology. Furthermore, this display achieved an impressive 170-degree viewing angle with very little loss in brightness or contrast at the most extreme angles. The LCD display includes 4 aspect ratio options for scaling and zooming video content, which Sharp places under the "view mode" menu. They include sidebar, stretch, smart-stretch, and zoom. For 4:3 sources smart-stretch works best. The scaling conversion was excellent and we found little distortion in the picture using any of the modes. The Sharp LC-37D7U LCD flat panel has excellent sound reproduction, well-designed menus, a bevy of inputs, multiple installation options, and an on-screen TV-guide system that can control recording to a VCR or DVD-R device. Its only shortcomings are a frustratingly small menu display font and not having a forward-backward tilt installation option without opting for the tilt wall mount accessory. Using this LCD television is generally a pleasure. There are easy access buttons on the remote for all of the most important settings and options: view mode (Sharp's term for aspect ratio control), a picture location adjustment, and Dolby Virtual on/off are among the handy feature that are assigned their own buttons. A few rarely used controls such a picture-freeze and closed-caption control, are underneath a door at the base of the remote. Unfortunately the useful AV-MODE button, which allows the user to switch between different video configuration profiles, skipping the video adjustment menu, is hidden under the remote door as well. Navigating through on-screen menus is generally straightforward. Sharp uses the same drop down menu system it uses in its cheaper, non-AQUOS line of LCD TVs, but the AQUOS LCD menus feature a cleaner, easier to read screen font, and shadowed overlay on top of the screen. Unfortunately, for a display that can be comfortably viewed at 10 feet, reading the menus becomes a challenge for those without perfect vision (or at least perfect corrected vision) much beyond 7 feet. Otherwise controlling the display is a pleasure. Across the Sharp D7U line LCD product, Sharp provides powerful 10-watt speakers housed below the screen. It would be nice if Sharp graduated their speakers and amplifiers so that buyers of the 36-inch LC-37D7U could fill more space with sound than buyers of the 26 inch D7U series, but 20-watts total power is sufficient to fill most spaces where the 36-inch LCD TV will be used. I found that raising the treble to between +5 and +8 on its -15 to +15 scale made narration slightly crisper. I also found that for some movies, enabling the Dolby Virtual did a commendable job at creating the illusion of depth. Toggling between Dolby Virtual and stereo to determine your preferred mode is a painless task thanks to a shortcut button on the remote. Those users needing to connect this LCD TV to multiple sources have plenty of input options: three composite inputs, one DVI, one HDMI, two component video using RCA jacks, one s-video, and a host of accompanying audio inputs. The three composite coaxial input jacks include a cable/antenna analog jack, a digital cable jack, and a digital antennae jack. For purely digital connections, users can choose from HDMI, the single-cable digital video/audio gaining traction for interconnecting digital components; 24-pin DVI, the display's only computer connector; or i.LINK. The DVI input, which can be used with VGA-only computer with an after-market adapter cable, is paired with a 3.5 mm stereo mini-jack audio jack to make connecting to a computer's audio output easier. The display also includes two I.LINK (also known as FireWire or IEEE1394) connectors for connecting i.LINK equipped hard disk recorders or Blue-ray disc recorders. Sharp's manual says FireWire or i.LINK equipped DVD-recorders, digital video cameras, and computers cannot be used with the TV—too bad given the popularity of i.LINK camcorders with consumers. Switching between inputs is easy using the input menu, which automatically detects which jacks have devices connected and adjust its options accordingly. New to this generation of AQUOS is a built-in TV guide system. When you first plug in the TV you are asked for a zip code during the initial configuration, since the programming information is location dependent. The system collects information from broadcasters while the unit is turned off and displays programming information on-screen in an interactive format similar to those used by satellite and cable providers for some years now. In order to use the system though, you'll need to connect your TV either directly to a cable feed or antenna (the display has a built-in CableCARD slot to make this easier) or connect the LCD television to a satellite or cable box via a composite RCA connector since the TV-guide system can't collect programming information over component video. 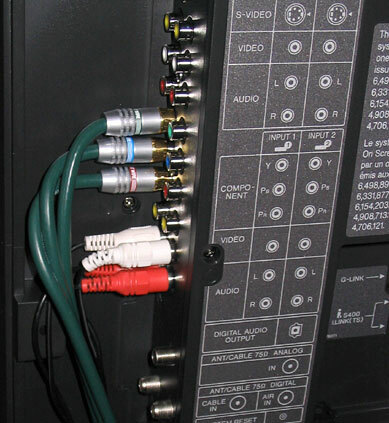 Users can program the TV guide system to automatically record a program on their VCR, using an included G-Link cable that controls the VCR and, if attached, a cable or satellite box, via infrared. The Sharp LCD television manages to maintain an impressive viewing area without wasting space. With the included swivel table stand attached the unit is 28 1/2 inches tall, 12 inches deep, and 32.5 inches wide. With the included table-display the screen is easily adjustable from side to side thanks to a solid handle on the back of the display, but it can't be adjusted for forward or backward tilt. A wall mount ($120USD street), tilting wall mount ($135USD street), and articulating wall mount are all available as options. For recessed installations users will want to consider that the majority of generated heat vents through the top. This unit consumes up to 195 watts of power, but since the LC-37D7U is a lot bigger than a light bulb, there is plenty of space for the heat to dissipate. Furthermore, like all Sharp AQUOS D7U series displays, cable connections are recessed into the unit under a removable plastic cover. On the smaller LC-26D7U there wasn’t enough space to fit high quality cables under it. Here there is plenty of space to cover the cables, but aligning the cover into its holes is still a chore. Sharp is one of the only manufacturers with a 37-inch LCD offering on the market today so there is light comparison out there. With a street price upwards of between $3,000 to $3,500, the LC-37D7U is expensive compared to similarly sized plasma HDTV offerings, typically ranging in cost from about $2,500. Still there are many compelling reasons to invest in LCD technology, including no screen-burn when used with computers and a superior technology for brightly lit rooms and anti glare situations – even if black levels suffer slightly. If LCD technology is right for you, top dollar will get you the best, latest, and biggest offering in the high-end AQUOS line with near-flawless picture, excellent sound, a full-set of features, and plenty of future expansion options.